This is a statue of Ohrid’s most important inhabitant, Saint Clement of Ohrid. 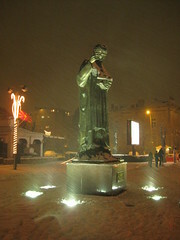 He lived from about 840 to 916 AC and was a pupil of Saint Cyril and Saint Methodius, who are said to have invented Cyrillic script (although some discussion is going on that topic, it might have been Saint Clement himself). Anyway, as Bulgaria’s first archbishop he reformed the Slavic church by introducing the Cyrillic script and the Slavic language, as form of independence from the Byzantine empire (church language was still Greek). Ohrid became a religious centre, and even nowadays there are many churches (although many were converted to mosques during Ottoman time). Travelling in Eastern Europe, esp. Bulgaria and Macedonia, you see his name everywhere (at least if you are able to read Cyrillic script), e.g. the ‚main‘ university in Sofia is named after him and Bulgaria’s scientific base on Antarctica too (though you will not find in Eastern Europe). This entry was posted on Mittwoch, Februar 10th, 2010 at 20:10 and is filed under Uncategorized. You can follow any responses to this entry through the RSS 2.0 feed. You can leave a response, or trackback from your own site.